Rated 5 out of 5 by Robbie from 75 grain . Is a great bullet for my MSR Savage I had to adjust the rifle gas . Once I dialed that in. This bullet is just something else. I hit bulls eye all day long at 100 and 200. Sometimes in the same spot. So sub MOA. At 500 yards with a Nightforce NXS 8x32 fitted with a Bors ballistic computer fro Barett . Getting on target is no issue. Have not gone further yet. But again See no resaon to swith to the 90 as of yet. Rated 5 out of 5 by Georgia Shooter from Shoots great for us At 525 yards we were consistently hitting steel 1/2 IPSC targets with 8 MOA holdover (the ballistic app said it should have been 10.5 MOA). We were also hitting 6" steel plates around 80% of the time at the same distance with a variable breeze. It's not match grade ammunition but then it's not as expensive either. Rated 3 out of 5 by Casey from Finally got this caliber to work for me Finally my 20" Wilson Combat barrel with a match trigger from Gisele allowed me to shoot this round sub MOA. I shot 4" diameter at 613 yards - after months of trying. But I must add that getting this caliber to work was very much a frustrating experience. i would take the 6.5 Creedmoor over this caliber anyday. so much easier to shoot good groups. Rated 5 out of 5 by Nick K from Perfectly Happy! I bought a case of this ammo and not one issue. It seems the Savage MSR 15 guys have lots of problems. My rifle is an Aero/Ballistic Advantage built 20" 1:7. Shoots MOA all day with AE 75gr TMJ. Rated 3 out of 5 by The Rainbow Connection from good ammo thus far. I have yet to test the round beyond a 100 yards but At that distance I was shooting .841 average groups. I have a 24” 1-6.5 twist barrel. Rated 1 out of 5 by richard shooter from DISAPPOINTING I drank the Kool Aid and bought 4 .224 rifles and a lot of Federal .224 both 75 and 90 grain. Went to a range I go to every year and after carting this gun to Vegas and meeting my friend who just bought a JP Custom .224 we were both underwhelmed with the round. The groups were inconsistent and the drop was not much better than a .223. In fact he brought his Les Baer Thunder Ranch .223 with a 16: barrel and it crushed both of our "magic" .224 rifles, even at extreme distances. 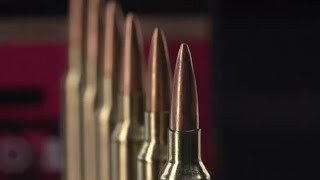 I would take my .308's or 6.5's against this new round any day of the week. My friend is a retired Army Captain and a gun dealer who shoots lights out so I know it wasn't me it was the round. Rated 1 out of 5 by Denny from Blown primers Bolt locked up tight in the barrel extension due to lost primers several times. Fusions ran fine in the same setup but the cost advantage was no longer there. Not a Savage firearm. Rated 5 out of 5 by Ken F from Surprisingly accurate I shot 224 Valkyrie 75 grain for the first time and boy was I surprised. I walked up to my target and all but one of my bullet holes were touching. The one straggler was my fault. This is at 50 yards without a bench rest. I was leaning up against my 4x4 with kids in it . So I took the target out to 120 yards and started zeroing my scope with 90 grain soft points. the wind was gusting to 10 miles an hour . This round is everything they say it is. I am just a weekend shooter. By no means a Marksman. I would recommend breaking your Barrel in cheerfully. I clean mine before and after the first shot and then every few shots. This is the only AR that I want to shoot now. 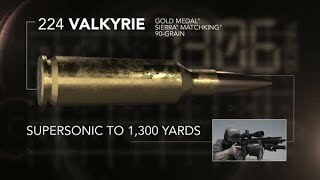 As well as 224 Valkyrie shoots, I don't think it's going away anytime soon.